A girl was out hunting seagull eggs, and she fell off the bluff and was all smashed up. They brought her home; she was just screaming and crying. The shaman…boiled some roots and let her drink the water. She calmed right down, and she was even laughing while they were straightening her out so she could heal. Shamans were masters of healing and natural medicines. This tall hat belonged to an Alaska Peninsula shaman, whose outfit also included a bird rattle, charm belt with grizzly bear claws, a spirit whistle, and bracelets made from river otter snouts. 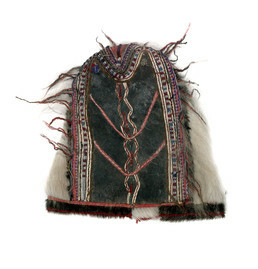 The hat is skin, painted black and stitched with caribou hair and colored thread. The side panels are caribou, and the bottom trim is sealskin with a white patch of caribou. Sven Haakanson, Sr.: Everybody sitting here—now you’re getting scared of these shamans. But I used to be inquisitive when I was small. Why were there shamans? And why did they allow them to stay? Each village had a shaman and a lot of times you hear the story of the old, ugly, crippled-looking shaman. But they said in Eagle Harbor and some [other] places that, if somebody fell down and maybe broke his hip or back or something, the community wouldn’t render him useless. They would take him and let him become a shaman, because he couldn’t hunt and fish anymore. He’d hobble around, but he’d learn all the methods. And the shamans were usually good people who helped people when they were sick. They had medicines that they got from the mountains that cured people. Old man Demetri told me at Eagle Harbor that a girl was out hunting sea gull eggs, and she fell off the bluff. She was all smashed up, and they brought her home. She was just screaming and crying. And the shaman went up the hill and came down and made some kind of roots and boiled them and let her drink the water. She calmed right down, and she was even laughing while they were straightening her to so she could heal without being all messed up. So those shamans were really good. They studied their whole lives to be shamans, to help their people, and they were good people. But later on after some Europeans came with all kinds of flu and diphtheria and stuff that killed a lot of people, the people didn’t trust the shamans anymore. They went for bromoquinine instead. They went to the white doctor and the Russian doctors. So this made those shamans who were good people pretty bitter. But they knew these powers and medicines and stuff that can put you to sleep, like what made that girl heal. And they could even put you in a sleep so strong that people would think you’re dead. And it’s because they were mad. They lost their jobs, and they started using that in evil practices. “These articles were formerly used by the shaman in his rites. Shamanism does not exist at present among the Ugashagamyts (people of Ugashik village) and Agliamyutes (Yup’ik people of the upper Alaska Peninsula), all of them being members of the Greek Catholic (Russian Orthodox) Church. Sugpiaq shamans, who could be male or female, were believed to have powers that could be used for both good and evil purposes. (3) It was said that they could cure the sick, quell storms, read minds, change into animals, dive into the earth, fly through the air, and see into the future. (4) In the Sugpiaq language, the original word for shaman is kala’alek, meaning “one who has kala’aq [a helping spirit or supernatural power].” A shaman’s helping spirits—who were birds, animals, or human souls—informed him about events in distant places, transported him on journeys to other worlds, and helped or harmed people according to his wishes. (5) Parts of the Ugashik shaman’s outfit, such as the grizzly bear hair seen on the hat, the bird rattle, and river otter bracelets, are probably charms that helped to summon and control these spirit helpers.